Our home, which has fondly been named "Moose Manor" is 5 minutes to Stratton Ski Resort and family-friendly activities. You’ll love Moose Manor because of the mountain views, the close location to the resort and outlet store shopping. This ski home has an open floor plan with high ceilings. The home has 3 guest bedrooms and 4 bath + an additional Enclosed Loft Suite with ensuite 1/2 bath. Moose Manor sleeps 12 and can extend with futons and pull out couches up to 17. The main floor has high ceilings and open floor plan. Beautiful mountain views can be seen from the Kitchen, Dining Room & Great Room. The main floor has lots of windows to see Bromley Mountain. The large U-shaped couch in front of the fireplace can also pull out to a Queen Bed for the larger group. The dining area has a very large table and chairs to seat 10, 2 additional folding chairs can be added to seat 12. The kitchen has a center island and also a peninsula with 8 stools. Two stools are higher for the smaller skiers in the group. Off the Great room is a deck with a Weber grill and small table with 4 chairs. Additional outdoor chairs are stored in the shed if needed. The master suite is off the kitchen and has a queen bed with a down comforter and an ensuite bathroom with shower. There is another full bathroom off the kitchen as well with tub/shower. The Loft Suite is an enclosed loft and is accessed from the main level by a stair ladder. The enclosed Loft Suite has a queen bed and a single bed. There is also a small single bed for the young skier. The loft suite has an ensuite 1/2 bath as well. Moose Manor is a ski home and as you enter the home, there is a large area for skiis and snowboards storage. As you continue to enter into the home on the ground level, there is an open skier sitting area with plenty of storage space for boots and winter gear. The sitting area has lots of windows and a wood stove with a viewing window. This room also has a futon that convert to a double bed. "The Bunkroom" is on this level and the room contains two bunk beds. One has a double bed and a twin on top, the second one has two twins. The second master suite is also down the hall and has a queen bedroom and ensuite full bath with tub/shower. At the end of the hall, is another bathroom and shower. The full size washer and dryer is also in the bathroom and a line closet with blankets, linens and towels to support your holiday group. Moose Manor is perfect for couples, families (kids love all the Moose), and big groups. The home has lots of fun games to unite all ages. Our favorites are Gestures, Chess, Golf and Dominos. We also have a blast with the WII game. The flat screen TV in the Great Room has a Fire Stick for internet streaming, Wii and DVD with lots of great movies. There is also a Sunbowl parking pass for one car to use during your stay. We are a skiing and boarding family and love everything winter in VT. Moose Manor is used extensively by us and our friends. We only rent out a few weeks a year when we visit our family in CO. We love the Manor and encourage our guests to make themselves at home. We also rent properties through the Home Away Companies and know what makes a home easy to enjoy and the need for storage, empty closets, spices, coffee on the first morning in a clean and well stocked home. 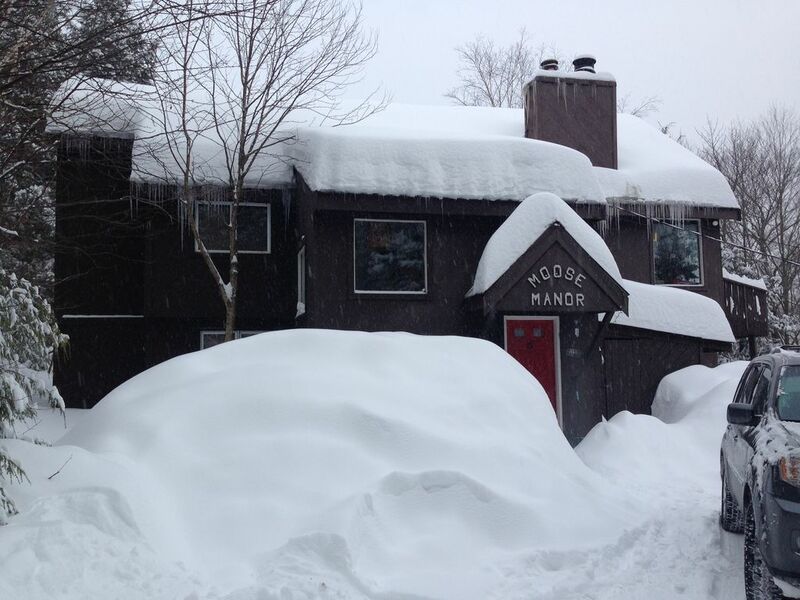 We have been skiing at Stratton for over 25 years and we have years of enjoyment at Moose Manor. In 2017, we purchased Moose Manor from our parents. We have a multi-year renovation plan and during the summer of 2018, we completed exterior maintenance and painting on the home, deck and outbuilding. In the fall of 2018, we painted the Great room and kitchen. We also replaced the carpet in the Great room, main entrance & ski/snowboard storage room. New flooring in the kitchen and guest bathroom off the kitchen was also replaced. Stratton Mountain is an exceptional mountain and is very family friendly. The gondola and all the high speed 6 passenger chairlifts make it easy to meet your group at the top whether you enter via the Snow Bowl, Ursa or Snow Bowl lifts. In additional to the excellent trails, there are glades and parks for all levels. In the Sun Bowl is the Nordic Center with beautiful trails to stroll, snowshoe or cross country ski. Manchester is 20 minutes away and has a number of unique and outlets stores to wander through including Orvis' flagship store. Views of Bromley Mtn from the Kitchen, Dining room and Great room. Electric baseboard with temperature control in every bedroom, bathroom and both great rooms. Lots of Flannel and Cotton Linens provided, including blankets and Comforters. Down comforter also provided for those extra chilly Vermont nights. Plenty of towels and washcloths for personal and also for kitchen use. There are also linen napkins. Two Gathering places. Great Room on Main Floor with views of Bromley. Family recreation room on the lower (ground) level. Our home is often used by the family so we always have spices, baking items, serving and baking dishes, supplies for the items your group may have forgotten. There is also two additional folding chairs for the larger family. In the master bedroom closet is a folding picnic table for the little skiers in the group. Located in the Great Room connected to Fire Stick and the stereo system. There is also Wii which is alot of fun. We have one preferred parking pass for the Sunbowl area of Stratton. we had a wonderful stay at Moose Manor! The house is very cozy and fit our group comfortably. Jeff made everything very simple and stress free, and I look forward to another stay! Thank You for your kind words Katie! Glad to hear your group enjoyed Mooseing Around at the Manor and we hope you all come back :). Moose Manor was perfect for our group of 11. A really cozy home just 5 minutes from Stratton base. A great bedroom layout with comfortable beds, an amazing fully stocked kitchen and a fantastic great room with high ceilings, lots of space and lovely views of Bromley. After a day on the slopes it was so nice to come back and relax in the large comfy sofa in front of that huge fireplace. Jeff & Robin were really great to deal with and answered all our questions. We all had a wonderful time here and would definitely recommend a stay at Moose Manor. Thank you so much for your very kind words and welcome to the Moose Manor family. Hope to see you again soon. Awesome home. Wanted for nothing. Beautiful kitchen had everything needed for a great vaca. Huge perk with the VIP parking pass. Moose Manor was exceptionally clean and well stocked. A great place to stay, plenty of room and loved having all the bathrooms with plenty of hot water for everyone to get showered after the slopes. Loved our stay. My only surprise was that there was no T.V. reception, the guys in our group were looking forward to relaxing at night and watching a football game over the New Year's Holiday but we were surprised to find no cable. My fault for not asking and overall they did just fine being unplugged for the weekend. Jeff and Robin were a pleasure to work with and were very attentive to any questions we had. Would highly recommend a stay at Moose Manor !!! Manchester is known for it's outlet shopping and is approximately 20 minutes from Moose Manor. Stratton Mountain Resort has a wonderful village with lots of shops and restaurants. The mountain also offers music in Grizzleys which is above the main lodge. Grizzley's is a family friendly restaurant and place to be for apres skiing enjoyment. During holiday, Stratton often has fireworks and other events. Check out the Stratton website for specific events happening during your stay.